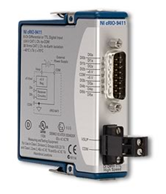 Synchronous Serial Interface (SSI) encoders are a great tool for absolute measurements. They are particularly helpful when designing a control system to return a machine to an exact location. Because they are absolute and use Grey Code, the user can be sure to get a repeatable point or angle. A differential clock signal with a specific number of counts must be sent to the SSI encoder to get a discrete reading. 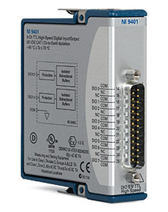 The SSI encoder returns its signal to a data acquisition (DAQ) product at the same rate as the clock signal. The bits are read by the DAQ, and then the value represented by the bits can be determined. The encoder is ready to receive another clock signal to transmit the next location after an encoder-specific minimum time interval is allowed to lapse without a clock signal. SSI encoders require a very precise clock signal with which to sync their signals. In most instances, a software timed digital clock signal will not work. Software timing, in general, is not precise enough. Because of this, a DAQ with hardware timing is required to get a good reading from an SSI encoder. Orbis, Inc.’s Encoder System is a hardware-timed SSI DAQ system with completely customizable software and the ability to read as many as 36 SSI encoders. The Encoder System is based on National Instruments (NI) cDAQ hardware and LabVIEW software allowing for maximum flexibility. The NI cDAQ-9178 is a DAQ chassis with four 32-bit hardware counter timers. 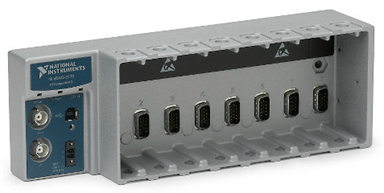 It has eight slots for c-series modules. The hardware counter timers are used to provide the precision timing signal for the clock. The NI-9401 DIO cModule is used to supply the clock signal to the encoders. It is an 8-channel 5V DIO capable of using the counter timer signal from the cDAQ-9178. The NI-9411 DI cModule is a 6-channel 5-24V DI module. It reads the digital pulse train supplied by the encoders. The encoder system is completely customizable. Because it runs LabVIEW software, anything can be done with the data received from the encoders. The cDAQ architecture allows for modules with other functions such as thermocouple, AIO, Counter/Timers, etc. to be installed. Any necessary logic can be programmed to react to the data read from the SSI encoders. The system can be controlled by an integrated touch screen Panel PC or any PC via USB. By creating the Encoder System, Orbis has supplied the market with a highly flexible SSI encoder interface. If you have any questions, please do not hesitate to contact us. We would be happy to discuss the particular needs of your automation application.